Discussion in 'Hilton Honors' started by Gagravarr, Nov 8, 2017. * Sadly not a global offer, just at this one Hotel I'm at, and only 6-8pm. Still, the free G&T after work took the edge off the as-ever terrible Bangalore traffic getting to the hotel! endian675 and JoeD like this. 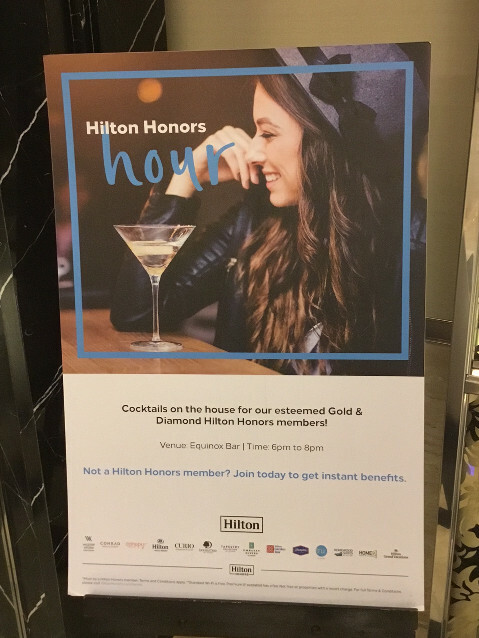 Interesting that they've bothered to put together a proper Hilton branded poster though and 'Hilton Honors Hour' sounds pretty good. Maybe something to keep an eye on? Yes, I find it tends to have that effect on many minor troubles! Latecomer - but I'm Hilton gold and stayed at Conrad Algarve last week, they didn't just offer complimentary cocktails, but also a cocktail making 'experience'! Thank Joe, not sure why it took me so long to realise how useful a forum like this might be to my point collecting addiction!